Ka Chow! Lightning McQueen is making a pit stop in Edmonton! Is your kid crazy for the Cars movies? You don’t want to miss seeing Lightning McQueen in person. As Disney-Pixar get ready for the June 16th release of Cars 3, they are sending Lightning McQueen on a Canadian Road Trip. 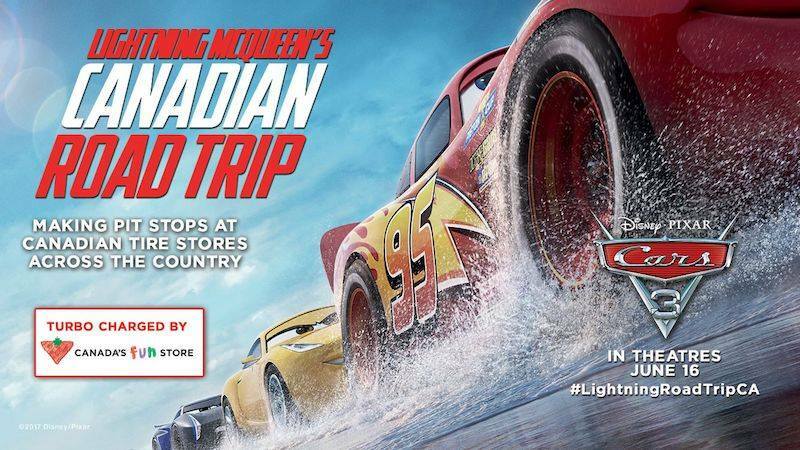 In partnership with Canadian Tire (because where else would Lightning want to hang out), Disney-Pixar is inviting Cars enthusiasts to see the life-size lookalike Lightning McQueen. The winner of 5 Piston Cups! Fans will be invited to take their photos with the life-sized character car, test their driving skills on a remote control race car track, and check out the Disney Channel’s Kids’ Activity Pit Stop (arts & crafts). There are TWO stops for the Edmonton fans! “Cars” (2006) and “Cars 2” (2011) took in more than $1 billion in combined worldwide box office. • “Cars” won a Golden Globe® for. “Cars” won a Golden Globe® for best-animated feature film and two Annie Awards for best-animated feature and best music in an animated feature production. Composer Randy Newman won a Grammy® for best song written for motion picture, television or other visual media (“Our Town”). The film was nominated for an Oscar® for the best-animated feature film, as well as best achievement in music written for motion pictures, original song (“Our Town”). • “Cars 2” was nominated for a Golden Globe® for. “Cars 2” was nominated for a Golden Globe® for the best-animated feature film, in addition to a host of other industry nominations. I am so excited to see this movie coming out. I have seen CARS 1 and 2 in theaters and even though my son is older now we won’t miss this one. I missed our local event and was so disappointed! This looks like such a fun event. I can’t wait for the film! YOuare going to love this. It is so much fun to be had. Can’t wait to hear what you think. I can’t wait to see Cars 3, we love this movie. I know the moment my kids find out this movie is out they will be dragging me and their dad off to see it. Great movie! My boys are gonna flip when they find out there is another Cars movie coming out! The first two movies where so cute and favorites in our house! I hope they visist some place close to our area so that we can check this out too! OMG I soooooooo can’t wait for this movie to come out. I am HUGE CARS fan, and my girls loved the first two. So they will be super excited to see this one for sure. That is awesome Lightning will be coming to Canada. We just had a visit with him here in DC! Can’t wait for Cars 3! This looks like another cute movie. I really enjoyed watching the first two with my niece and nephew recently. I will have to take them to see this one.